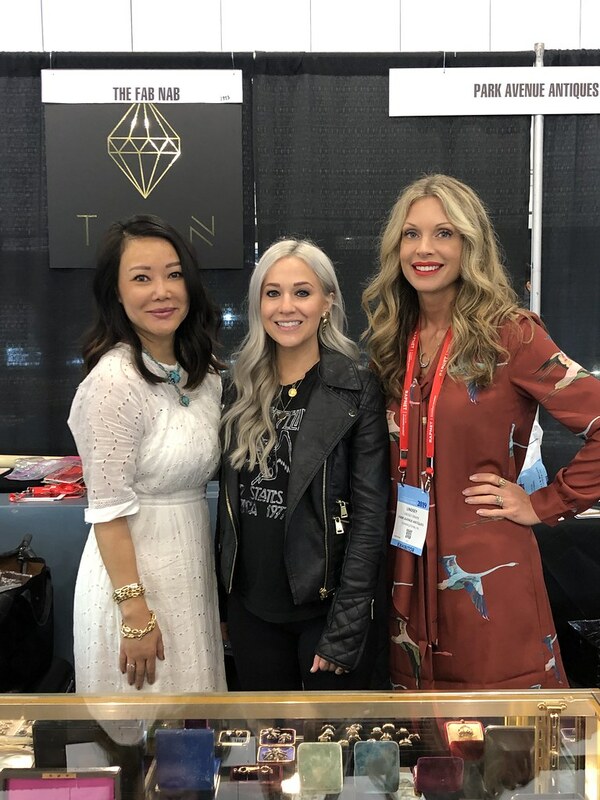 Loved meeting The Fab Nab finally in person and her case was so dreamy! Look at all those old colorful boxes. 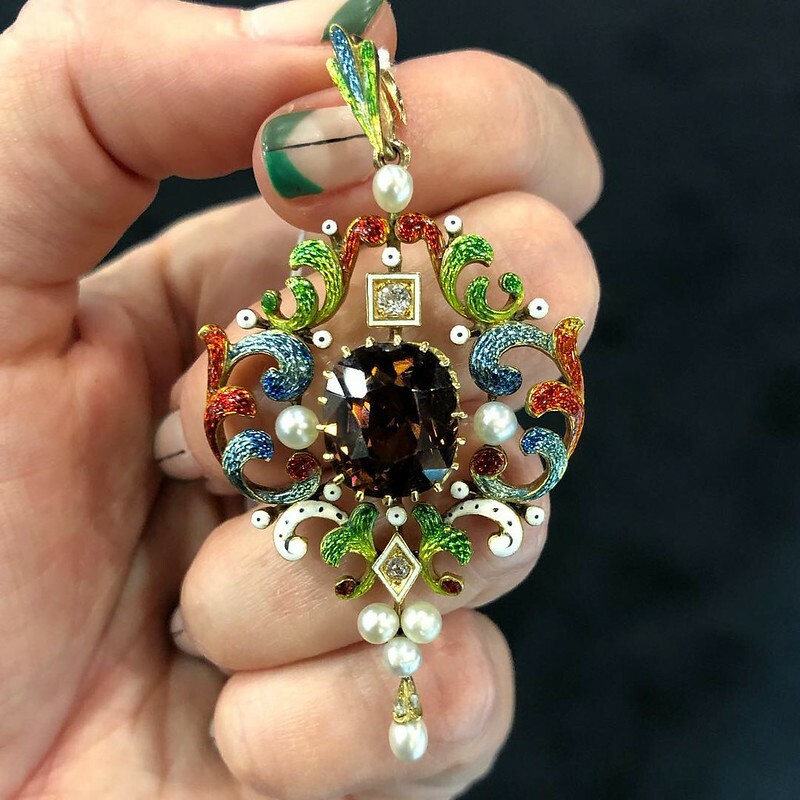 I flipped for this pendant from Keyamour — the colors of the enamel are so vibrant and varied, and I love the unexpected brown zircon. Bright-eyed and bushy-tailed for day one! Myself along with Becky from Diamonds in the Library could not wait to dig in! 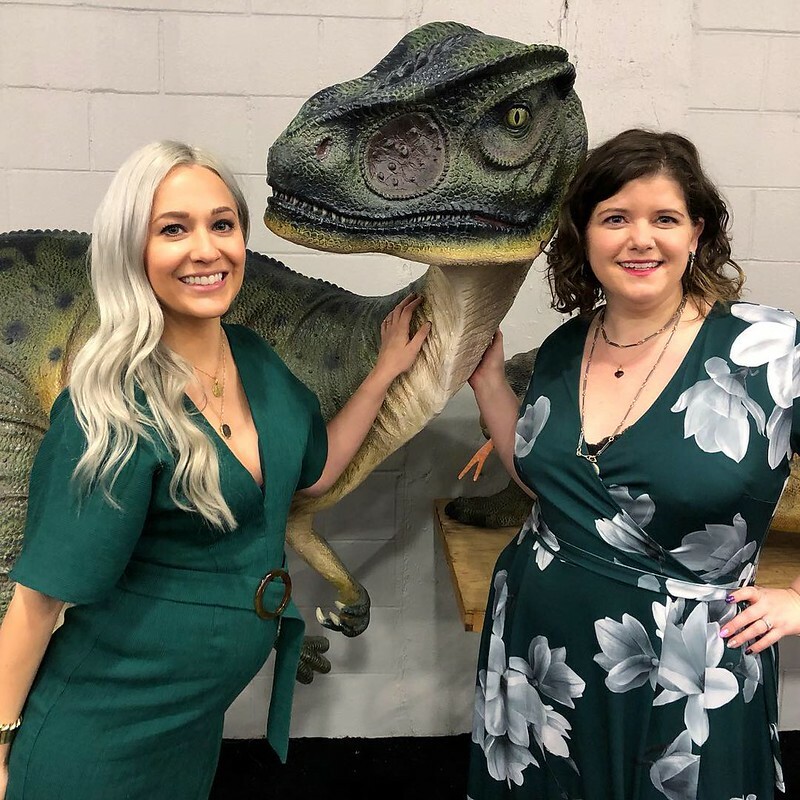 But first…dinos! 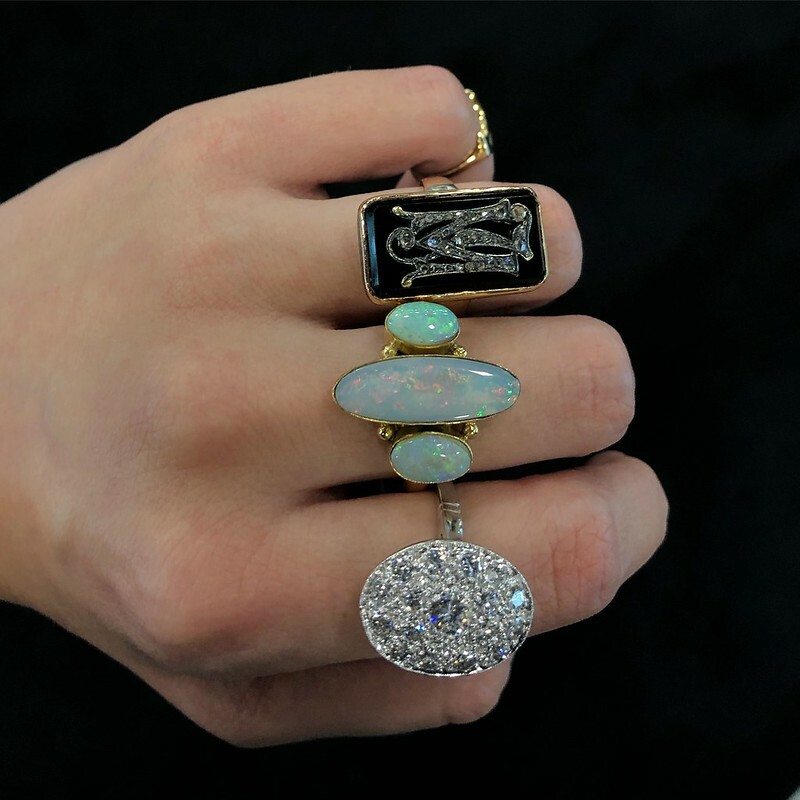 Jewels by Grace is always a fun booth to visit, not only for her impeccable taste but bubbly personality. These rings match her so well! 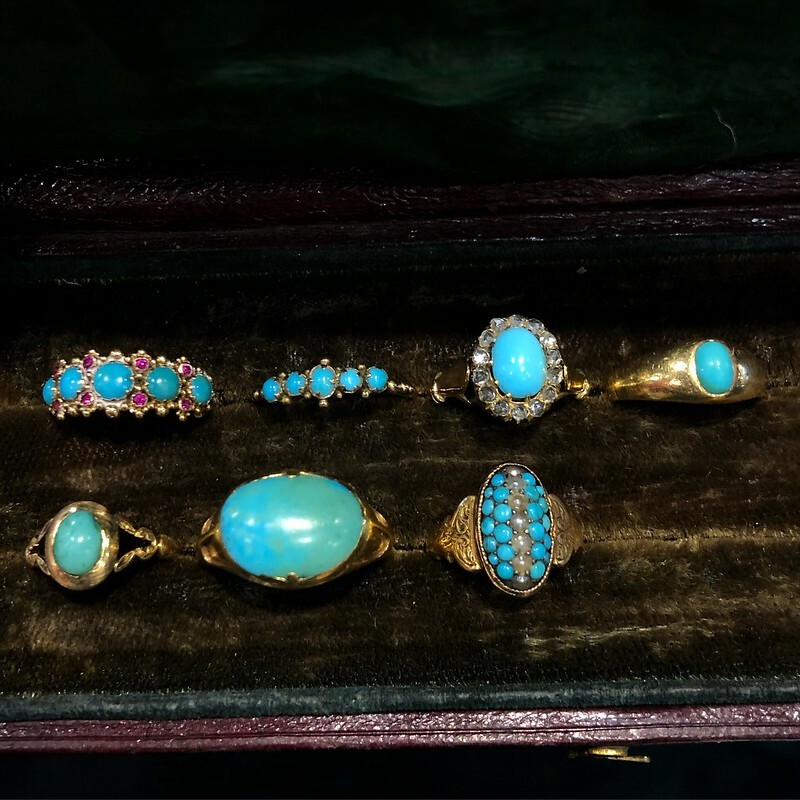 Box of turquoise treats from Ishy Antiques who let me munch on some Wheat-Thins while visiting him. He’s the best. Such gorgeous pieces from Park Avenue Antiques — loved putting this look together and even left with a little something. Day Two started out with a visit back to The Fab Nab (left) after lusting over a ring I left behind and then buying a ring from Park Avenue Antiques (right). I call this the swoop and scoop. 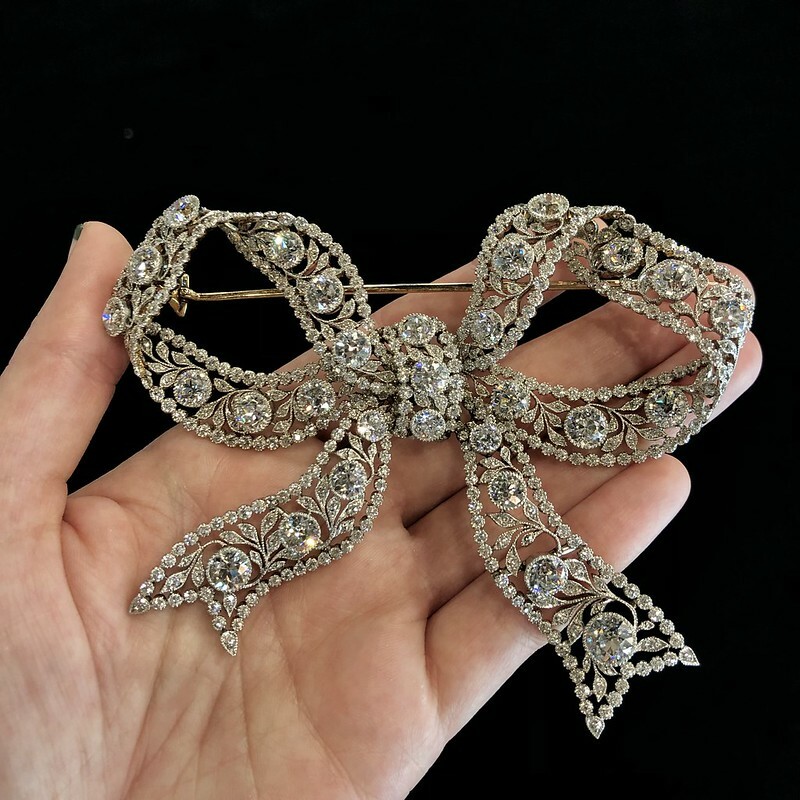 This brooch! Can you even?! 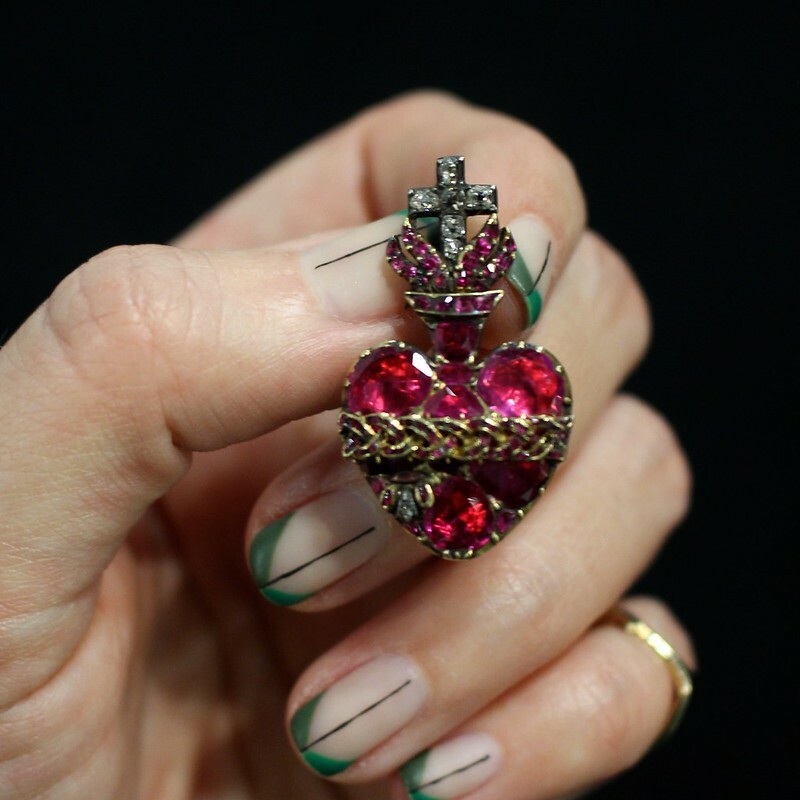 From 5th C Jewels and circa 1700s. Those rubies are glowing! Larry & Natasha from Platt Boutique Jewelry are always fun to catch up with at shows — was excited to see his spread as he didn’t attend OMBAS the past two years! Good to have them back! 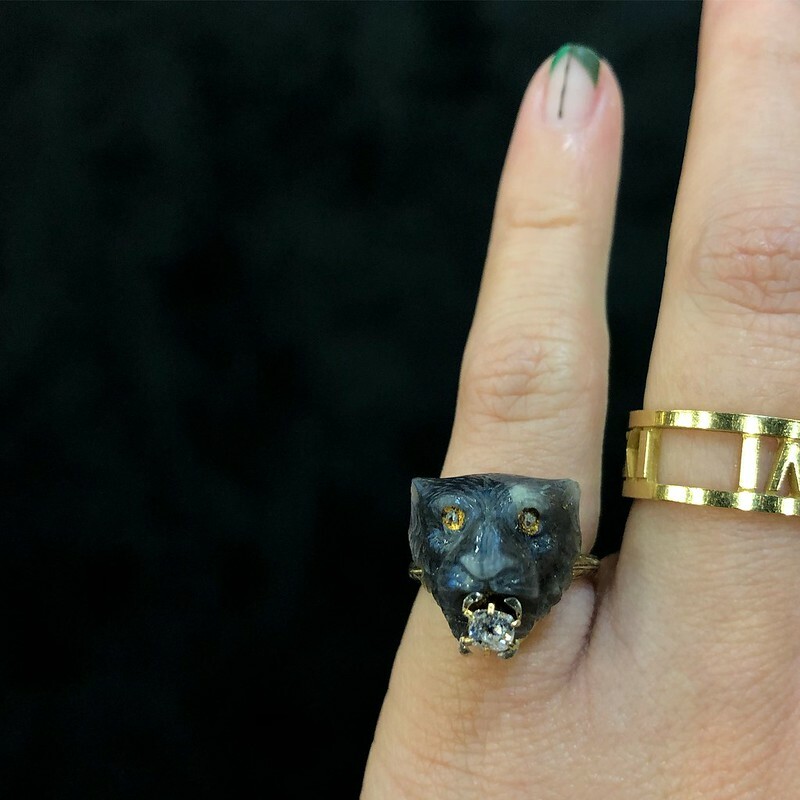 Under the Crown Jewelry was excited to show me this ring on my middle finger — I can see why!! It’s so me! 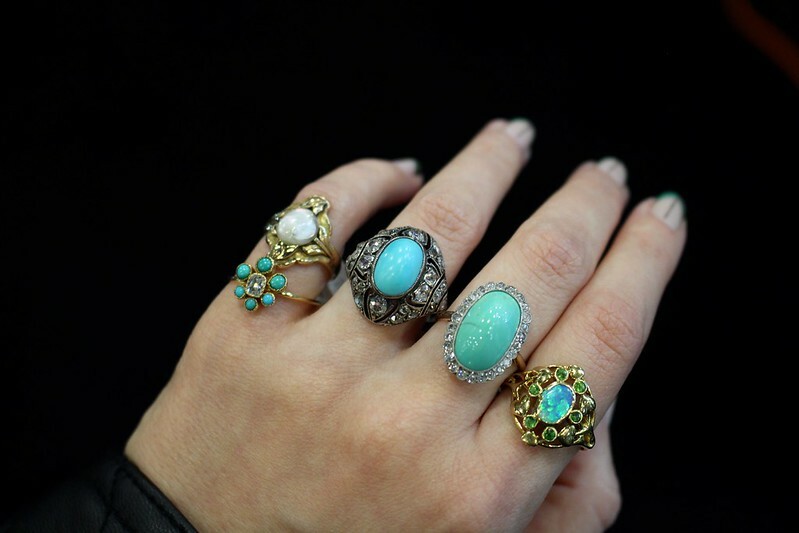 I’m so in love with these two rings — both from Jim’s of Lambertville. 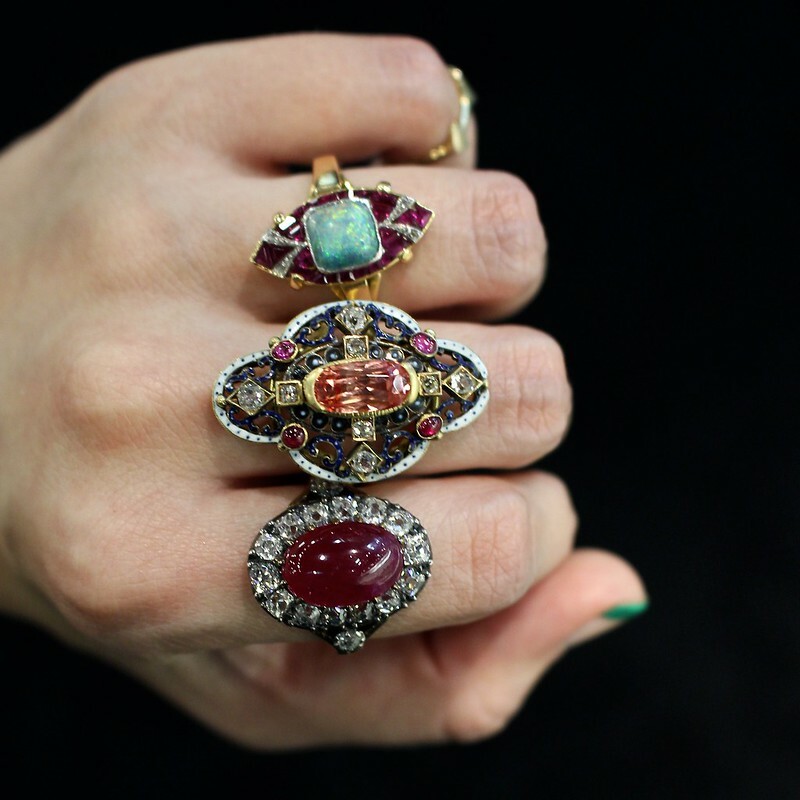 They were the first pieces of the show, as you can see I still have my personal Tiffany Atlas ring still on (accident). If you want to see more from the show, just browse the hashtag #OMBAS on Instagram and get ready to drool. 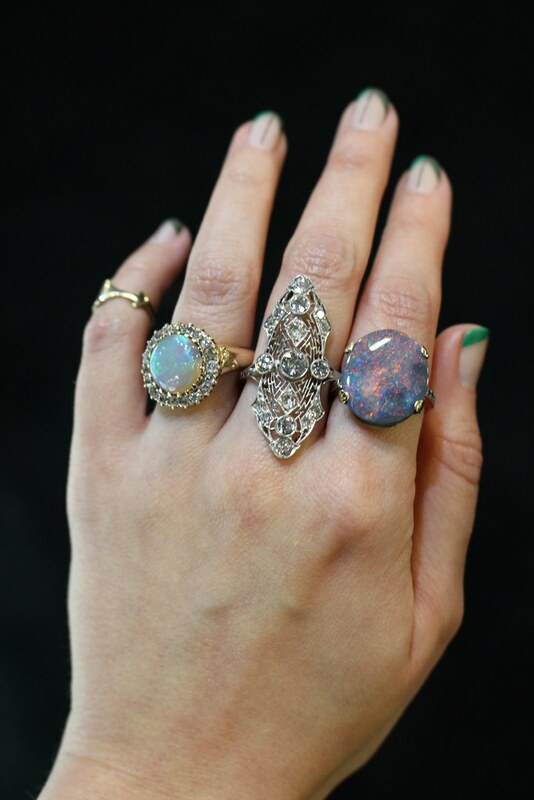 I tried to be slick and ask my followers which one of these rings did they think I bought (all from The Fab Nab) and almost everyone guessed correctly. You know me too well. 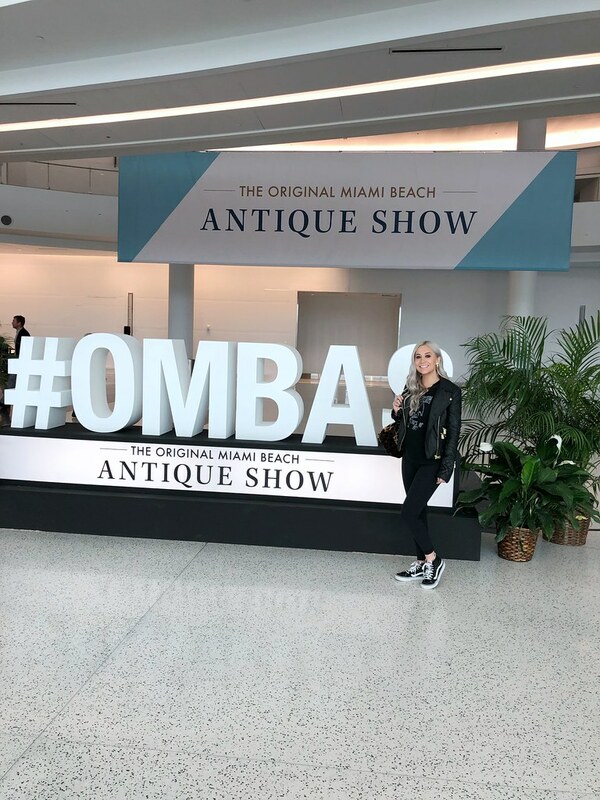 This year the Original Miami Beach Antique Show headed back to its original location — the Miami Beach Convention Center — and opened its doors to an eager crowd of show-goers who couldn’t wait to shop till they dropped! I was excited for the show to be back in South Beach this year as this was year EIGHT for me. I can’t believe I’ve been going that long and it’s interesting to compare the years, as every year has changes. 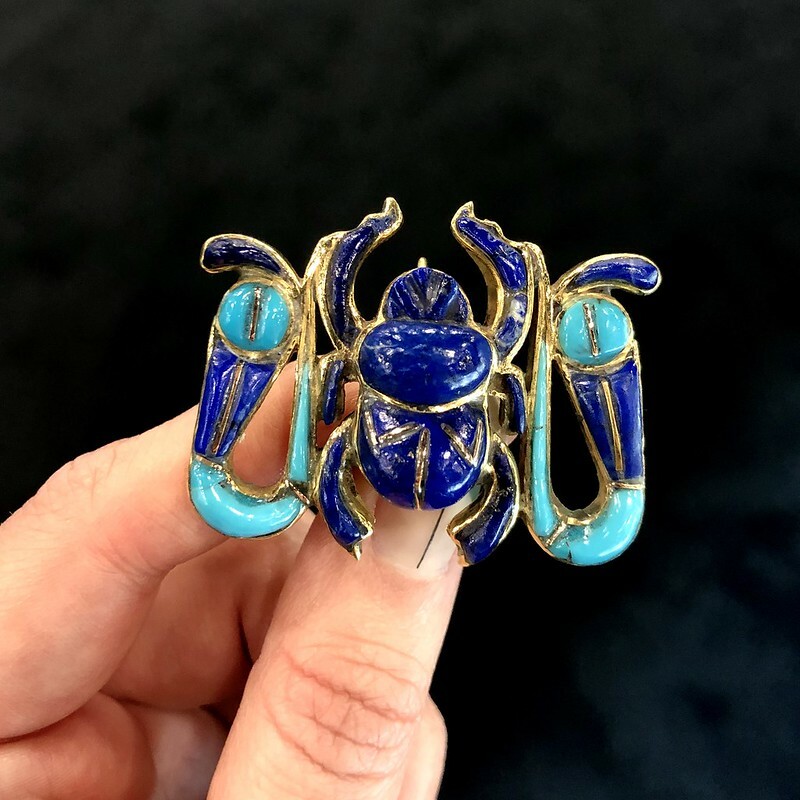 There’s no doubt that the antique jewelry world is growing; I’ve been seeing the crowds increase year after year. But the enthusiasm remains the same from both the attendees and the dealers. If it says anything, I wasn’t going to let a baby growing inside me keep me from attending OMBAS! I was a little nervous about going — I didn’t want to fly, I didn’t want to risk getting sick from seeing so many people, I didn’t think I could handle all the walking, etc etc. But the amount of happiness and adrenaline that happens from this show far outweighs all the “what ifs” and if you’re one of those people that has never gone to this show because of some random excuse you keep telling yourself, listen to me: you need to go!! 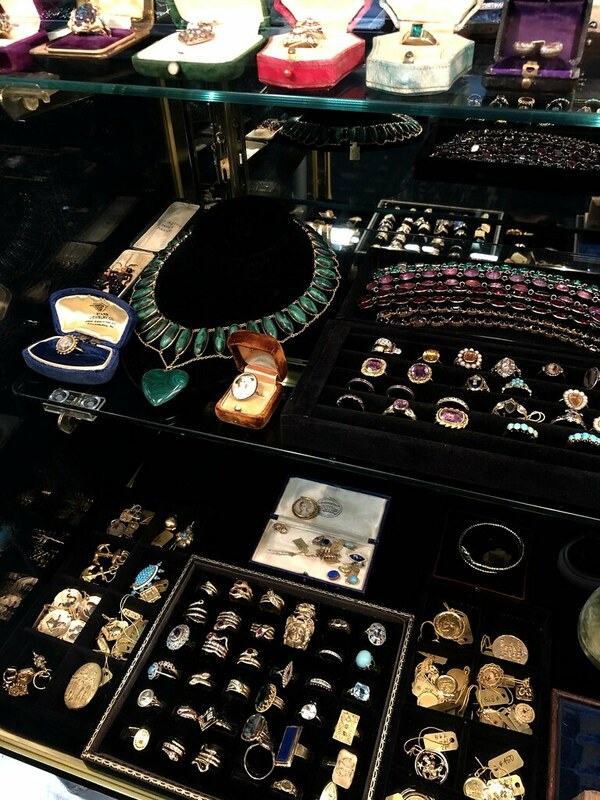 The amount of beautiful jewelry that I saw was enormous, just within the span of two full days at the show. I took things a little slower than I normally do this year, having lots of drinking fountain breaks, and I have to acknowledge all the very sweet dealers who offered me snacks or a place to rest in their booths — that was very kind of you! My favorite pieces are documented above along with captions, so you can view the dealers. As with last year, I made the mistake of jumping around a lot instead of picking a starting point, and going up and down the aisles. On the second day I tried to be more consistent and it really made a difference. Still, I missed so many booths and always feel like I’ve missed something extraordinary. Such a terrible feeling! 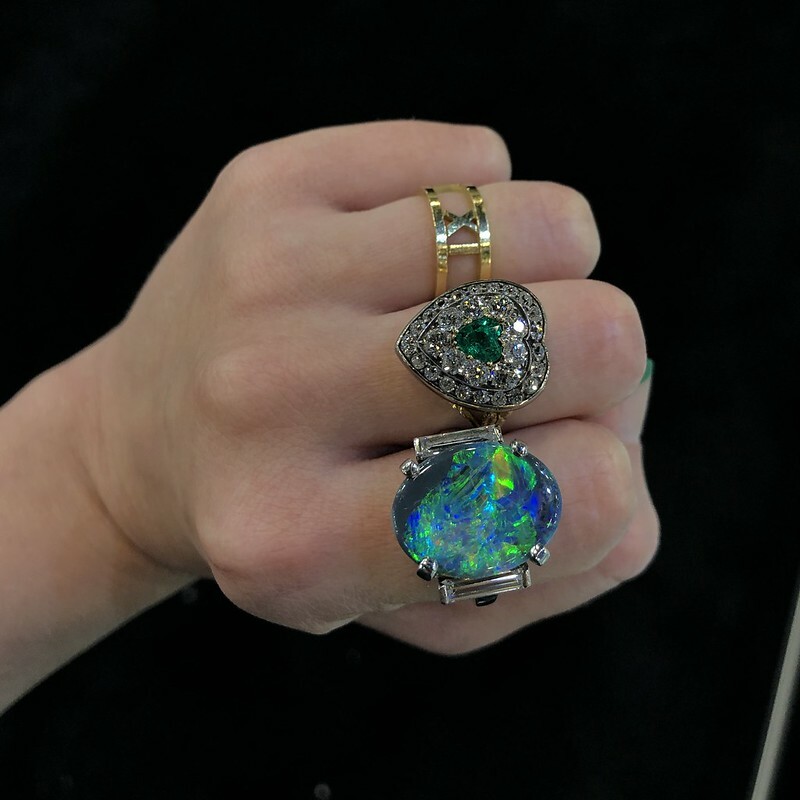 I gravitated toward opals this trip (for obvious reasons) and saw a lot of Georgian navette rings. 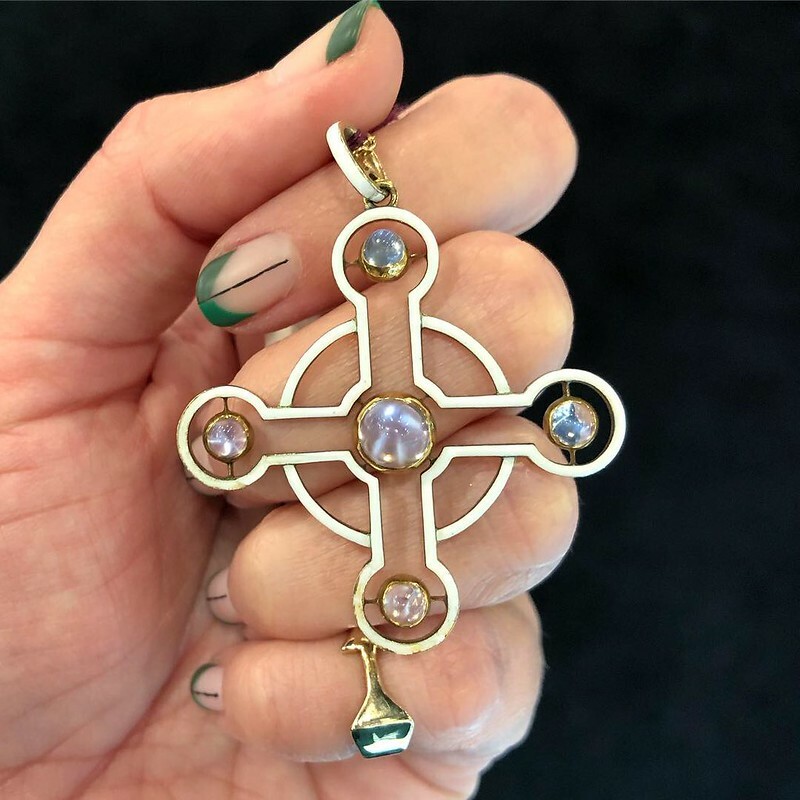 I noticed a shortage of snake rings from most dealers and a plethora of ugly 80s jewelry that dealers are hanging on to because if herringbones are back, maybe this stuff will be soon as well?? Not sure if it was because I don’t usually hunt for this type of jewelry, but signed pieces seemed to be not as prominent as they once were. In the past, there were so many booths that were prominently signed Tiffany & Cartier pieces and this year I didn’t notice this occurrence. Did you notice anything this year? Trends? 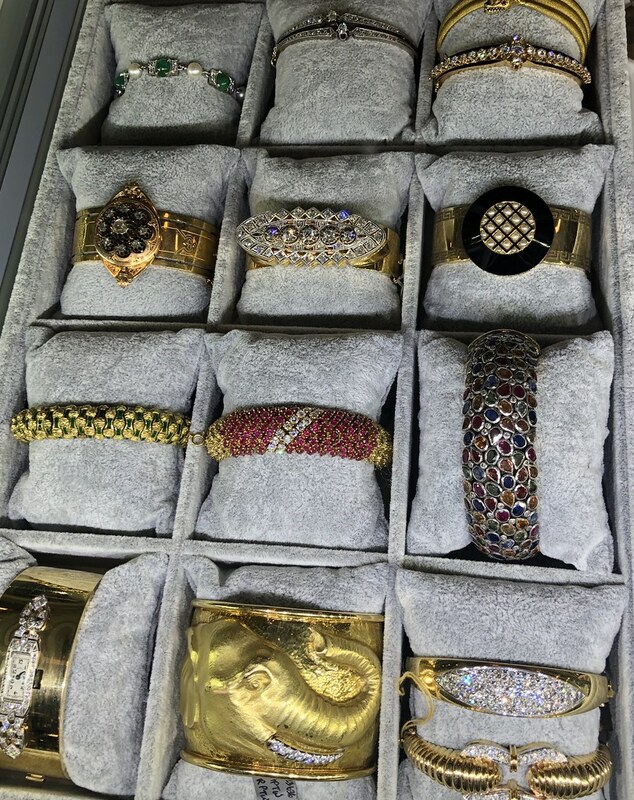 If you’re wondering — yes, I’ll be sharing some pieces that I bought while in Miami that I will be offering for sale over on my inventory page @shopGemGossip so if you like my finds or didn’t get to attend but want a piece, be sure to check it out. 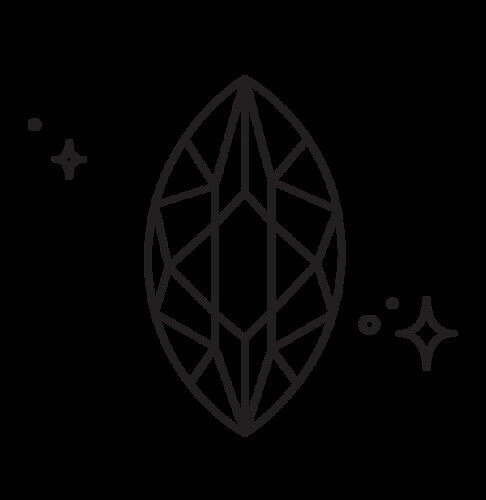 I’ve already posted my charm haul and have sold some pieces — rings coming soon! I even bought some earrings!